If you ever have a need to publish photos online, such as on your website or a social media account, you need to be VERY careful to make sure you have the right to do that. Otherwise, it could be a very expensive lesson. When you need a picture for some project such as a business website, or your blog, or a Twitter post, what’s the easiest way to find that perfect image? Google image search, of course! I mean, Google has many millions of images indexed so you’re sure to find LOTS of photos that will serve the purpose. But you better not do that. There’s a company called Getty Images, and their entire business model is based on catching people who use digital images online without having the right to do so. Getty has purchased the copyright license to a huge collection of images, and they spend their days searching websites and blogs and social media sites looking for any of “their” pictures that are being used without authorization. If you are using one of their images, they’ll find you and the first thing you’ll get is a very direct letter stating that they own the rights to the image, you don’t own the rights, you used the image without permission, you owe us money. The amount being demanded can range from $100 up to thousands of dollars, depending on the image and the usage. I had a client who received a letter from Getty demanding $700, and they ended up just paying it rather than trying to figure out who was right or wrong in the situation. And I would guess that’s what most people or companies do – for a payment of a few hundred dollars, it’s cheaper to just pay it rather than hire a lawyer to fight it in court. So Getty probably goes unchallenged in most of these cases. And really, even if you do have the rights to the photo, could you actually come up with the proof of that? Or could you produce evidence that you purchased the usage rights from the actual owner? If you can’t (or don’t want to bother with it), the only other option is to just pay the bill and get on with your life. So today’s tip is just that – only use images that you have the right to use, and keep the paperwork and proof of purchase in case your rights ever get challenged. As you might imagine, Getty is not very popular with a lot of people. They make their money by sending large invoices to people that aren’t expecting them, so many of their transactions involve parties that are very upset at this unexpected bill that they’re being forced to pay. That’s what makes this recent story so wonderful. One of Getty’s recent targets was Carol Highsmith. Highsmith runs a nonprofit called the This Is America! Foundation, and posted an image on the group’s website. Getty Images sent her a letter, just like they usually do, accusing her of copyright infringement, and demanding a $120 “settlement payment”. Except this situation was a little different. In this case, Carol Highsmith actually DID have the rights to publish the image that the Getty letter referred to. And how did she have the right to publish the image? Because she was the photographer that created it. Yeah, you might say that Getty Images kind of stepped in it that time. Carol Highsmith is a professional American photographer who has traveled across the country, documenting life in America through her amazing images. 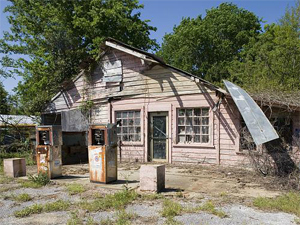 The photo of the abandoned gas station at the top of this article is one of hers. And she doesn’t even do this to make money – she is actually donating all of those images to the general public, through the Library of Congress. So anyone can go to the Library of Congress’ website and access any of the pictures in that archive, completely royalty-free. So it’s kind of ironic that she would donate this collection of her images for anyone to use, and then Getty Images accuses her of copyright infringement and demands payment for her use of her own photo. In fact, there are several publications that have used her images and credited Getty Images since Getty claimed the rights and required the purchase of a copyright license. This is kind of like if I stole a book from the public library, then threatened the author of the book with a lawsuit if he claimed any rights to “my” book. The fun part of this story is that Carol Highsmith has filed a lawsuit against Getty Images in federal court. She accuses Getty Images of illegally claiming the rights to her 18,755 donated images, and the lawsuit is asking the court for over $1 billion in damages. This is not the first time Getty has been accused of doing this (last time it cost them $1.5 million). It will be interesting to see how this one turns out. So remember to never use images if you don’t have the rights to them, but if they’re images that you own, stand up for those rights. Hubris always looks great on big corporations…..especially when they step out of line…..AND they know it. Chickens come home to roost! Is this company part of the super-rich Getty clan? Don’t know if there is any relation. 1. Getty Images and many other stock photography agencies making a living by representing photographers and licensing their images on their mutual behalf. While part of their income is derived from the successful pursuit of copyright infringements, it represents a small portion of their licensing income. 2. Commercial photographers spend a huge amount of money speculatively creating images that they then attempt to license commercially, either directly or through agents such as Getty Images. 3. When you do an image search through Google Images as I just performed just now, each image, when reviewed, provides the following notice – “mages may be subject to copyright”. Ignorance may be bliss but their is no excuse or justification to assume that you see is free for the taking. 4. There are companies located around the world that provide a service whereby if you provide them with low resolution digital files of your images, they will monthly perform a web search using a “Digital Spider” that reads images files on the web. Each month, those companies will provide their clients with a report listing the images they found on the web that are theirs with the urls they were found on. The agency or photographer can then review their records to determine of a license was issued to cover the use that was found, While I don’t know, I would assume the demand letters that are referenced were generated as a result of such a service providing proof that the images were downloaded from their website. 5. Getty’s web site provides terms and conditions that inform the user that among other things, the images can’t be used without a license and that they will pursue infringements on their images. 6. As to the case that is referenced in this Blog, I offer the following link to a legal post authored by Nancy Wolff, house counsel to the Digital Media Licensing Association (DMLA). In short the suit that was brought I believe will ultimately be dismissed based on the information this article provides. 7. The commercial photography industry is currently working with the U.S. Copyright Office to make changes to the Copyright Law to allow individuals or companies that have had their copyright infringed and where the damages are less than a certain amount (to be determined by the legislation) to seek damages in Small Claims Court which is much more efficient and far less costly than the current requirement to file in Federal Court. In summary, individual photographers and companies that represent them spend many millions of dollars annually creating copyrighted imagery and then marketing those images for licensing. If someone wants to use the images they simply need to pay for that right. Thanks Gary, great information. I’m certainly not a professional photographer or lawyer. While the case against Getty may be dismissed based on the legalities (and in spite of the fact that a previous case was decided against them for $1.5 million, and each case is determined on its own merit and details), I think most would agree that it’s a pretty scummy business practice to send an individual a payment demand for work that is in the public domain.